Typographics 2016 is in full swing. Workshops have started on Monday, with topics ranging from manual to digital, from sign painting over typeface selection to creating diacritics and kerning fonts. Attendees had the opportunity to join tours and studio visits from Wednesday on. The two walking tours in Brooklyn and Coney Island scheduled for this Sunday are fully booked unfortunately, but there are still two spots available for Paul Shaw’s off-conference Newark lettering walk. Be on the platform of the Newark-bound PATH train at the World Trade Center around 10:15 am. Don’t forget to bring your conference tag: Typographics attendees only pay $15.Also from Wednesday until Sunday, June 19 TypeLab 2016 offers a parallel schedule of specialised content covering typeface design and coding, and everything in-between. 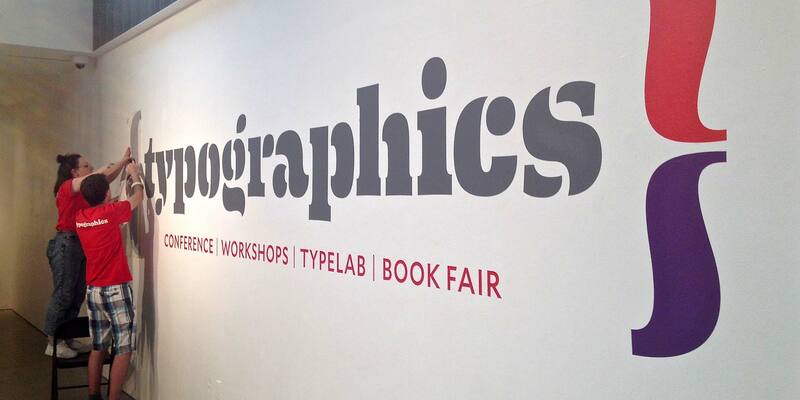 The Typographics Book Fair runs from today until Sunday; for Typographics attendees only on Friday and Saturday, but accessible for free for the general public on Sunday. The actual conference kicked off this morning – two days of inspiring lectures on Friday, June 17 and Saturday, June 18. The speaker line-up has a mix of seasoned veterans and young voices, with a healthy balance between women and men. On the Typographics blog speakers Indra Kupferschmid, Tobias Frere-Jones, and Nina Stössinger share their expectations for this year’s edition, and Douglas Riccardi gives conference-goers his culinary recommendations. So come join us for the exciting second edition of Typographics! Either in the flesh, or virtually via the live stream.